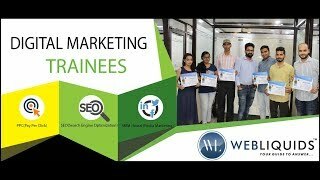 Webliquids is a Professional institute for providing Web education and Advanced Digital Marketing Training institute in Chandigarh, Mohali and Panchkula. 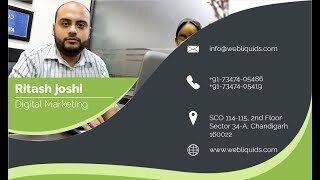 Webliquids was established in 2013 and till now we have successfully completed 1569+ PROFESSIONALS, 142+ BATCHES with 4.9/5 RATING from our Students. and to Train as many Students as we can in Advanced Digital Marketing Training. Webliquids Provides you a List of Study Options that are Running and are in Demand Today. With our Advanced Web Education Training, You can Make Your Future in any Industry. WebLiquids is Your Guide to Answer. If you have Any Doubt or Confusion about any Training Program, Feel Free to Contact Us @ +91-7347405486, +91-7508920783, +91-9501293387, +91-7347405419, 01724023733. Learn the fundamental of PPC and learn how to increase the ROI. Live case study project available. Learn the fundamental of SEO based on latest google algorithms. Case study of multi level projects are available. Learn to develop a websites with our core coding modules. Live projects. Learn the fundamentals of Designing to Enhance user Experience. Learn how to get higher brand authority fast & interacting with your customers regularly. Learn how to detect faults in a product before it is released and becomes operational. Learn from us Game Designing and Development including Advanced Tutorials. Learn the Nitty Gritty of Online Marketing. Boost Your Small Business Marketing Efforts. Reach out Your Potential Lead. Now it Time to Increase Your Sales & Revenue. Get the right career exposure. Get advanced technical & 100% practical knowledge along with hands- on training. Learn from highly experienced and professional experts. We provide live projects based training. Get 10+ ( Internationally valid ) Industry recognized certifications. Stay Updated with latest digital marketing strategies. Get theoretical and practical classes. Learn how a professional company works. In house 100% placement opportunities for outstanding trainees.